It's so hard to find something white in the items that I purchased during this shopping season! Aw man! I hope the FMB mommies will forgive me for this one! Babawi ako next week, I promise! The next Christmas party that I will be attending this week is my husband's company Christmas party. The theme is Mardi Gras and, as expected, everyone should be in a colorful outfit for that night. I'm lucky that colorful pants and shirts are the in thing this season so I got myself an aqua blue pair of pants and a bright pink shirt. While we were on the look out for my husband's attire at Robinson's Galleria, my husband was able to spot a rainbow colored hat and tie. 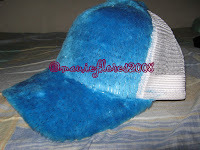 I also spotted this furry baseball cap that I thought would look good with my outfit. I loved it the first time I saw it so I bought it even if it was priced at Php350. I thought it was cheap considering that the stall is inside Robinson's Galleria. The stall's name by the way is Rebel Gear. I can't remember where it's exact location is in the mall but it's like an alley of tiangges and small boutiques. After the purchase, we moved on to the department store to find a suitable bright colored shirt that will go with my husband's hat and tie. He wore his cap and tie with the shirt that he chose in the fitting room. He also tried my cap on and it was he who noticed the price tag on the cap. Clearly written on an orange sticker was Php 150! We rushed back to the stall to demand a refund of our Php 200. The saleslady initially did not want to give us back our money but I threatened her that I will report their store to DTI Consumer Watch if she still resists. My point is, if it's on the tag then surely it's the retail price! And besides, there was an orange colored cap of the same style that also has a Php 150 orange sticker on the tag. She did not have a choice but to return our excess payment back. So that's the story of my fab holiday find for the week. 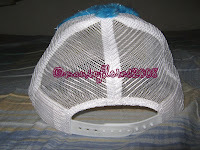 A party cap for Php 150! I will post our pictures wearing our cute Mardi Gras attires soon!